Well…I did it. I followed along in my Sourdough A to Z eBook and here is the bread I got. Never mind that it took my chilly kitchen twelve hours to raise my dough. That’s all a part of the sourdough bread making process – waiting. Just in case you were wondering, waiting for bread to rise is not very labor intensive. I just started my bread first thing in the morning, did a bunch of other work all day while I left my bread dough alone, and finished it last thing at night. The next day we ate bread. Easy! What I’m even more excited about are the Sourdough English Muffins I made from the Sourdough A to Z eBook!!! These could NOT have been any easier to make and my family devoured them! I made enough that we now have some in the freezer for this week, which is an added bonus. I’ll for sure be making these English Muffins on a regular basis. They are fantastic! I know I already showed you the sourdough muffins I made last week, but they wanted me to show you again so they wouldn’t feel left out of this sourdough posting experience. 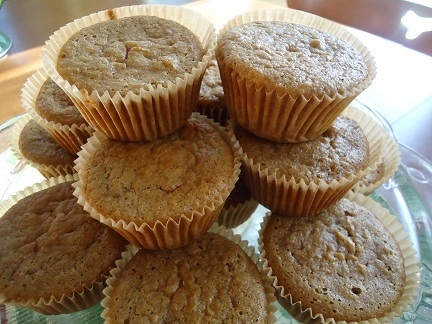 These muffins were also super easy to make, and my family loved them! Say Mmm is a great, free resource to help you with menu planning! Only one day left to sign up for the $50 Gift Certificate from FBS Books! My Sourdough Has Been Revived! I shared about making Sourdough Starter about two and a half years ago and was very excited to make sourdough breads a healthy habit in my kitchen. Making a sourdough starter is stinkin’ easy (and by stinkin‘, I mean that the starter really does begin sporting a mildly sour funk after a few days). 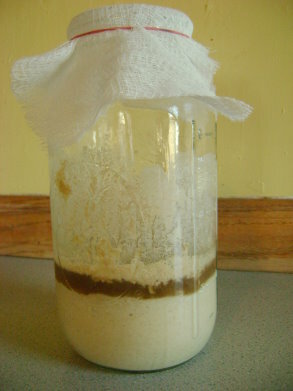 But I really had no idea what to do with my starter after it was started. 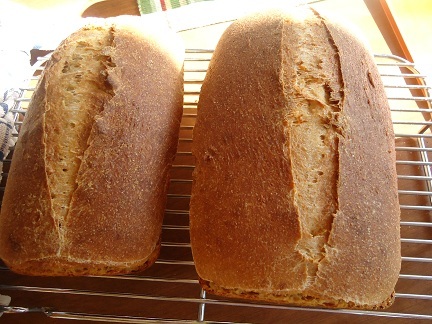 I played around with making bread a few times, but never got anything more than a few dense loaves that my family didn’t like. And so, my sourdough starter died a long, slow death in my refrigerator because after a few months, I stopped feeding it or trying to do anything productive with it. It’s a sad story really. 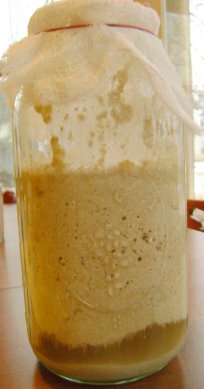 Here’s the front view of my jar of sourdough starter on day three. Again, see my cute little bubbles? If you eat a gluten free diet, never fear – Sourdough A to Z eBook even shares how to create and use a Gluten Free Starter!!!! Yes, we can ALL play at this game!!! 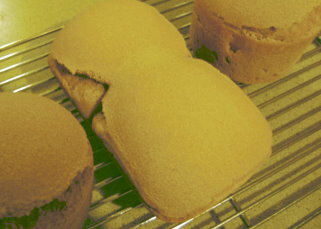 Tomorrow I’m going to follow the eBook directions for making a loaf of bread. I’ll share the results whether it’s pretty or not so pretty. Here’s hoping for a successful sourdough bread making experience! 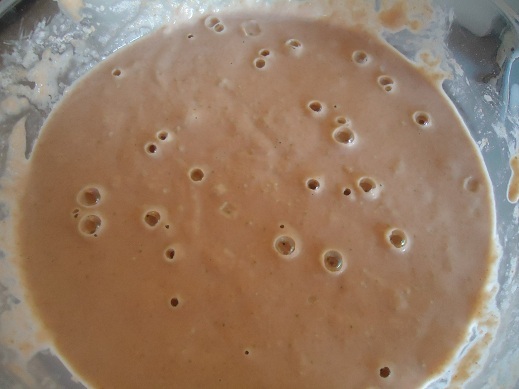 If you want to create a sourdough starter, but aren’t able to purchase the ebook, please click on this link and scroll down to the beginning of the series of posts that describe day by day instructions for how to make a starter. Since the recipes in the Sourdough A to Z eBook aren’t mine to share, I’ll only be able to talk about them and show you pictures of my results, but not print the recipes themselves. Okay, here’s hoping for a lovely loaf of sourdough bread at our house tomorrow!!! What’s been your sourdough experience? 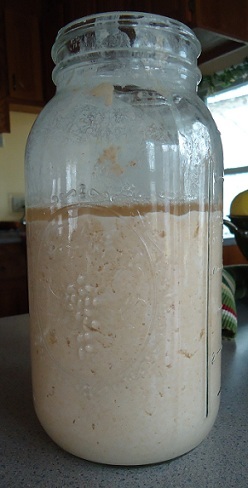 A couple of years ago, I wrote an entire series on making Sourdough Starter, walked you through the day-to-day process, took pictures of my little sourdough bubbles and helped you get off to a great start on your sourdough! I’m just not a sourdough expert. I know enough about it to answer some basic questions, but aside from making a kind of dense loaf of sourdough bread, I have felt a little bit stuck. I knew there was a lot more I could do with my sourdough starter, but what exactly was there, and how should I go about learning? The GNOWFGLINS (God’s Natural, Organic, Whole Foods, Grown Locally, In Season) ladies just sent me their “hot off the press” Sourdough A to Z eBook and Oh. Wow. Did you know that you can make like a million things with your sourdough starter? Crackers and cakes and muffins and tortillas and pita pockets and pancakes and English muffins and pizza pockets and a bunch of other things that made me want to eat the picture right off my computer screen! Wow. The Sourdough A to Z eBook walks you through the entire process of making a sourdough from start to finish. Then, once you have your starter alive and kicking…they teach you how to make all of these wonderful, healthy, easy to digest foods!!!! AND, guess what!!! While it teaches about all different grains, wheat included, there’s also a whole section in the Sourdough A to Z eBook detailing how you can make a GLUTEN FREE sourdough starter and how you can adapt all the awesome recipes to be GLUTEN FREE!!!!!!!!! I wasn’t sure whether to giggle or get weepy when I saw that section. I think I kind of did both. Yes, I did the weepy-giggle thing. It was cute. I can not tell you how impressed I am with the Sourdough A to Z eBook. It is 150 pages of incredible, easy to understand information and recipes and tutorials and tips. The GNOWFGLINS ladies did a fantastic job putting this together! In addition, if you are more of a visual person (like I am), they have an online Sourdough eCourse available that will knock your socks off. If you are interested in creating grain products that are delicious and incredibly healthy, I just can’t say enough good about the Sourdough A to Z eBook and/or Sourdough eCourse. The lovely ladies at GNOWFGLINS have offered to give away three of their Sourdough A to Z eBook here! I’m telling you…you WANT this Sourdough A to Z eBook. Unless you want the Sourdough eCourse. Either way, you’ll recieve a wealth of sourdough knowledge! Leave a comment here on this post if you’re interested in winning one of the three copies of Sourdough A to Z eBook. I’ll draw three random winners for this giveaway on Tuesday, April 12. 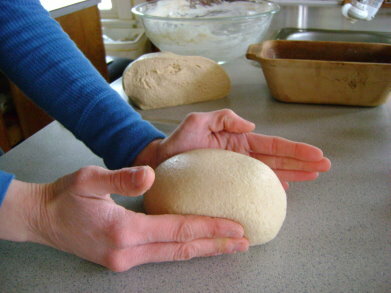 While following these basic steps to creating sourdough bread…in the morning after you add water, flour and salt…instead of placing the kneaded dough in a bowl to raise all day…then shaping the dough into loaves…simply shape the dough into loaves immediately after kneading it in the morning. SKIP the part where it raises in the bowl. I know this sounds weird…but try it. Since your starter has been fed and allowed to sit out all night…the yeast in it is already activated and a double rising the next day may not be necessary! The part I like best about this tip is that it saves TIME! My friend, Anne, who has more sourdough experience than I have does it this way every time and her bread turns out beautiful. I have yet to experiment much with my sourdough starter with recipes other than bread. However…a couple of you have been kind enough to send me some of your recipes…so I’m sharing those now. The night before your breakfast, place the 2-3 cups of starter in a medium size mixing bowl. Add 2 cups warm water and 2 cups flour. Beat well and set in a warm place, free from draft, to develop overnight. 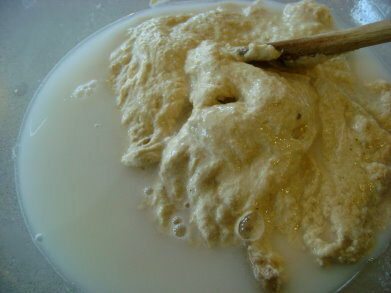 In the morning the batter will have gained 1/2 again its bulk and be covered with air bubbles. It will have a pleasant yeasty odor. Beat with a fork and blend in all ingredients. Add 2 Tbl melted fat. Bake on a hot griddle. Turn once. Serve. Mix well and add fat just before baking. Bake according to directions that came with the waffle iron. 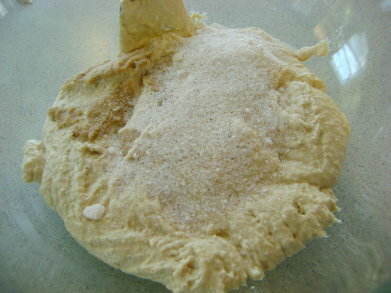 In a large bowl put 1 cup of sourdough starter, add 2 cups of warm water and 3 cups of flour. Beat until smooth, cover and let stand overnight. The next morning beat in 3 eggs, ½ cup of oil, 2 T honey,or Rapadura, 1 tsp of salt. 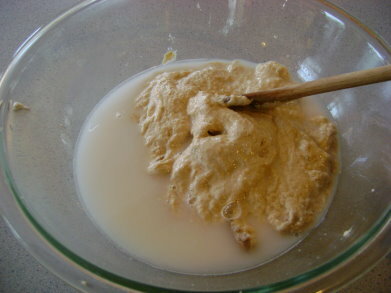 Stir in a small cup put ¼ t. baking soda in 1 T water and swirl around quickly and then pour right into the batter. Let stand 30 minutes and then use in a waffle iron. These are fabulous! The night before put 1 cup of flour, 1 cup of sourdough starter and 1 cup of milk. Hand mix well and cover and let stand overnight. The next morning add 2 beaten eggs, 1 tablespoon of honey,or Rapadura 1 tsp of salt, 1 tsp of soda and 3 T oil. Mix together and cook like regular pancakes. These are very yummy. 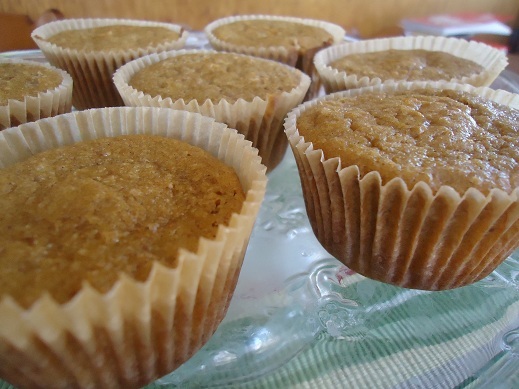 Mix 1 cup of flour, 2 tsp of baking powder, 1 tsp of salt, 1 tsp of baking soda, 2 T honey or rapadura. Then add 2 cups of starter. 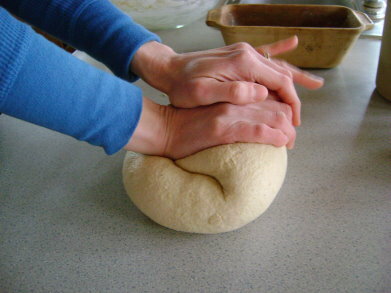 Add enough flour to roll in a ball. Roll it out to about ½ inch thick and then cut into pieces and shapes. They should be smaller than a biscuit, probably about half the size of a biscuit. We like making funny shapes. Fry in hot oil and then put on paper towels to cool. Thanks Heidi and Jill for helping us out with more sourdough recipe ideas! 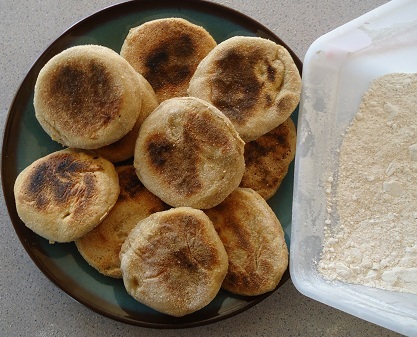 Jill also sent me her Sourdough English Muffin recipe which I will share soon! I also have a recipe that I will share soon for making sourdough pancakes just by soaking flour in buttermilk overnight (you don’t have to use a sourdough starter). YUM! Yay for all kinds of new recipes! Visit Tammy’s Recipes for more kitchen tips! 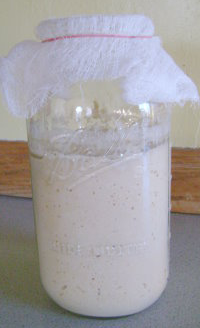 Sourdough Starter: Day 8…Time to Make Bread! 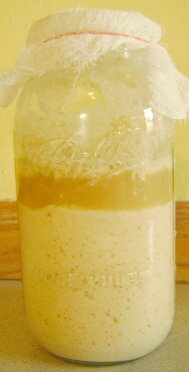 After seven days of feeding your sourdough starter with water and flour…it is fermented and ready to make into bread! Now, keep in mind that this method of making bread is an old fashioned method. It isn’t quick. (Neither is it difficult.) From start to finish, the bread takes anywhere from 8 to 24 hours. Most of those hours are spend just waiting for the dough to rise. I happen to like the pace of this bread making. Slow and easy wins the race. AND, the nutritional benefits?! 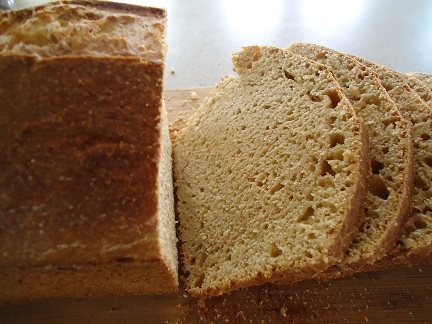 Because the bread is fermented, all of the difficult-to-digest phytates from the grain are broken down making this bread GREAT for your digestion! This is the best, most healthy bread you can make. 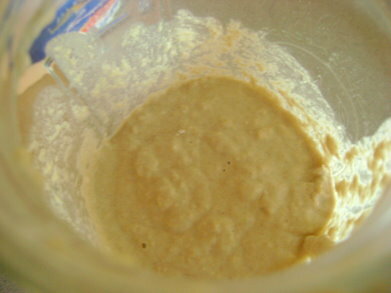 Here is what my starter looked like on the eighth morning. Put about one to two cups of starter into a quart jar, seal it with a lid and put it into your refrigerator for future use. Add 2 teaspoons of sea salt to the starter. Pour in 1 1/2 cups of cold water and stir until the salt it disolved. Slowly stir in flour, two cups at a time. For this batch, I only used about five cups. This is because my starter was not very liquidy to begin with. Remember, the more soupy your starter, the more sour your bread. I was trying to create a starter that was a little on the thicker side. 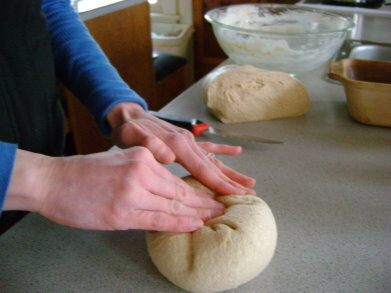 Place your well kneaded dough back into your bowl. 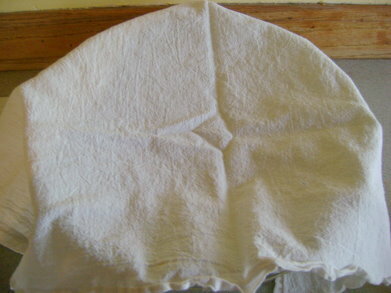 Cover your bowl with a clean cloth and set it on your counter. Now, the natural yeast in your sourdough will go to work to make the dough rise…and all the healthy bacteria in the dough will work to break down the phytates and release the nutrients! 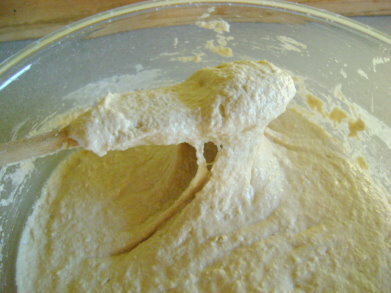 I put my dough in the bowl ready to start rising at 9:00 a.m. By 3 p.m. it had risen to about double. So this time, it took six hours for my dough to rise. In the summer you may find that it takes less time. Shape your dough into balls. 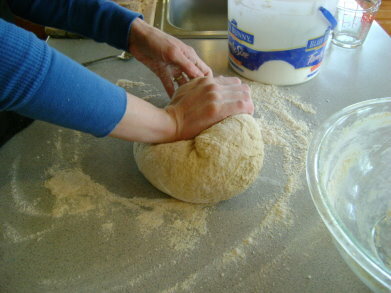 Good job Asa , taking time away from your math assignment to come take pictures of your mother’s hands with the dough. Oh wait, I think I was blinking in that one. I prefer to use my round loaf pans from Pampered Chef. When I use my regular loaf pans, you’ll notice that instead of making one long loaf to fit the pan, I shape two balls and set them side by side into the pan. The sourdough rises much better this way. When you are deciding on the size of dough for your pan, think small. 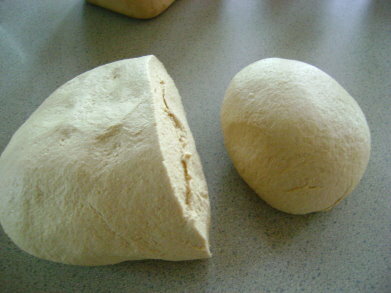 If you have too much dough in your pan, the bread not rise well and it will be very heavy. Because the sourdough has been sitting and working all day, the natural yeast in it has been activated so that the bread rising in the pans will not take as long as the initial rising of the dough. In about three hours, my bread was ready to go into the oven. Bake your bread in a 350 degree oven for one hour or until the bread sounds hollow when you thump it. Now, the next time you want to make a batch of sourdough bread…get your starter out of the fridge in the evening. Pour it into a clean glass jar or bowl. Feed it by adding 1 cup of flour and some cold water. 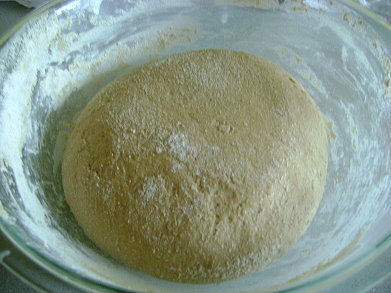 (You need to keep your starter fed about once a week whether you bake bread that often or not.) 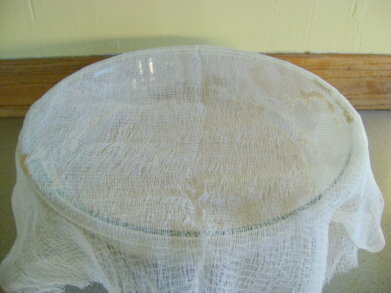 Place cheesecloth on top and let it sit in a warm place all night. 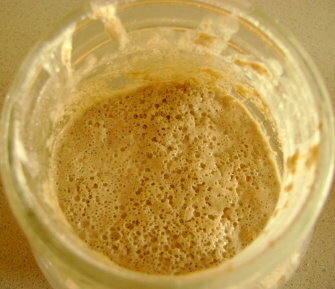 In the morning, if there are bubbles in the sourdough, indicating that the yeast has been activated, begin the above process of making a batch of bread…being sure to leave a few cups of starter in the jar for future use! Want to figure out sourdough pancakes with me too? I’m working on it! This morning my starter didn’t have any liquid hanging around anywhere. 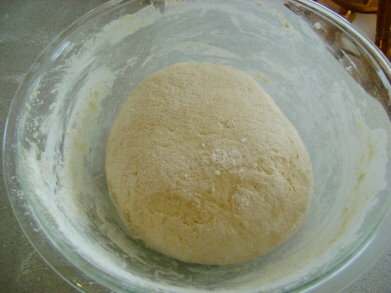 I think it is because yesterday I started working to thicken my starter so that it wouldn’t be SO sour. If you remember, I only added 1/4 cup of water. I’m glad I did that. It’s getting to be more of the consistency I want it to be now. Today was graduation day for us. (Oh, I couldn’t be more proud.) My starter went from big glass jar to big glass bowl. I didn’t want sourdough overflowing all over the place. Again today, I added a cup of flour and only 1/4 cup of liquid. 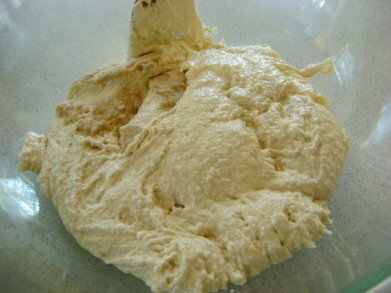 Here is a picture of how thick my starter is now. I layed a big piece of cheesecloth over my bowl without securing it with anything. On Day 7…just do the very same thing by adding 1 cup of flour and enough cold water to make your starter as thick (less sour) or as thin (more sour) as you want. I may try to pop back in briefly if I feel like there’s anything important I need to tell you about the Day 7 process. Whoa-oa-oa! Get back! So much for the “sweetly sour” smell of my starter from yesterday morning. A few of you commented that your starter was NOT smelling sweetly sour…but more like…well none of you said exactly. Although Cindy’s husband said that it smells like some of the calls he goes on (he is a fireman/paramedic). May I suggest a description something like a cross between a dirty gym socks and baby spit up? Okay…so sorry. DON’T let this discourage you from making sourdough!!!!! It gets better I promise! And…the sourdough bread doesn’t taste like the above mentioned descriptions. I PROMISE! This morning a lot of liquid had risen to the top of my starter…and it had a frothy film on the top of the liquid. The froth was darker than yesterday and there was less of it. This is normal. 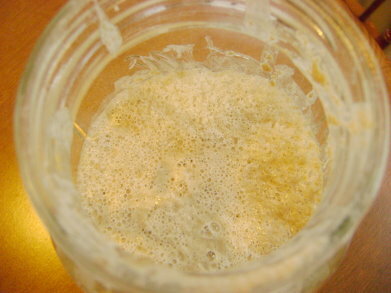 The more liquidy and soupy your sourdough starter is…the more sour it is going to be/taste. Some people like their sourdough to have a very strong taste. My family and I don’t prefer it quite so sour. Since this is Day 5 and there are only two days left before I make bread from my starter (woohoo! )…I decided today to start making my starter a little thicker to help with the over-sourness factor. This morning I added one cup of flour as normal…but only 1/4 cup of water. I also poured off most of the liquid that had risen to the top again before adding the flour/water. As I stirred in the flour/water…it all mixed in just fine and was by no means too thick to stir. 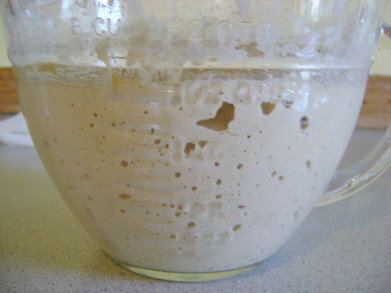 So, depending on how thick or runny your starter is at this point, you may want to adjust the amount of water you add. Several of you have asked if I would be sure to walk you through the sourdough bread making steps. ABSOLUTELY. 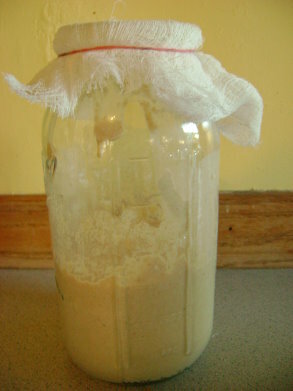 I would NOT dare tell you how to make a sourdough starter and then leave you hanging about making the bread. It’s a tiny bit of a different process than making “yeast breads”…but it’s SO not hard to make. I’m getting so excited to finally be able to make my sourdough starter into bread! Yay! So…anyone care to leave a description of how their sourdough is smelling by now? Here’s what my jar of starter looked like this morning. It is so exciting! When I stirred my flour into it yesterday, it was right at halfway full. 24 hours later..it has risen at least an inch if not more! And there are bubbles all through it. And I have this nice layer of froth on top. Yep…the sourdough starter is starting to become sourdough. You’ll notice in my top picture that I instead of the brown gooey liquid sitting on top of my starter like it had been on other days, it was at the bottom. I have no idea why…but it’s not a big deal. I just poured it all into a fresh jar just like that and it mixed back in. 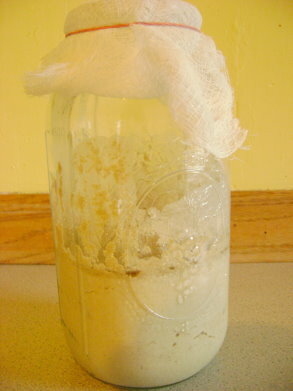 Okay, so again for Day 4…put your starter into a clean glass container, add a cup of flour and a cup of water, stir well, cover with cheesecloth and put in a warm place. I’m pretty sure tomorrow I’m going to need to transfer mine to my big glass bowl. It’s getting BIG! Oh, and it smells even more like sourdough today…just slightly…but I can tell it’s working. By the way…yours might not be doing the exact thing mine is. Yours is working in YOUR air and in YOUR climate. Yours might be working faster…or slower than some of ours are working. I am curious what yours are looking like though. Did you have a layer of froth today? Do you see bubbles?! I kinda want to describe my sourdough smell as “sweetly sour”. Does that make sense? What does yours smell like? Just getting started? Here are our previous sourdough starter days! Read Day 1 and Day 2 to catch up! Have you been sniffing your jar? I thought today mine smelled just a little tiny bit sour…just a little tiny bit. My jar is almost half full now…I may have to switch to a big glass bowl by the time these seven days are up! And speaking of glass bowls…Jayme asked WHY it has to be glass? Can you use plastic bowls? 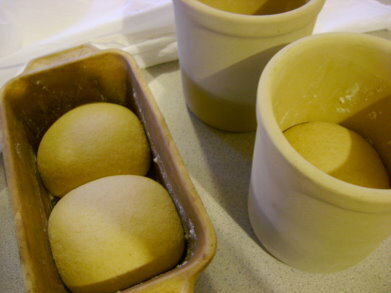 Sourdough should always be prepared in glass and baked in either glass or stoneware. Sourdough is acidic, therefore it will react with metal and plastic. It is very porous…so it will absorb the metalic or plastic-y tastes and qualities. For that matter…I try to always stir my sourdough with a wooden spoon. 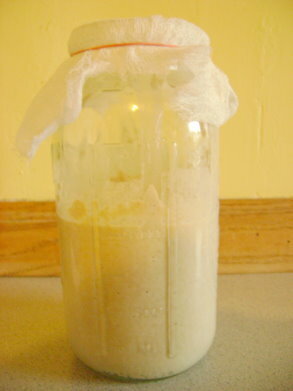 In case you missed it…here is Sourdough Starter: Day 1. I poured off the dark liquid that had risen to the top. 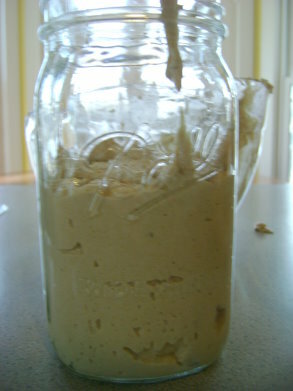 Then I poured my starter in to a fresh, clean jar. 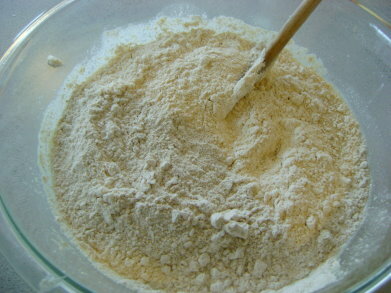 Once you have your starter in a clean jar or bowl, add 1 cup of whole wheat flour and almost 1 cup of cold water. Stir the flour in very well so that it is all moistened. We’ll be repeating these same steps over the next several days. 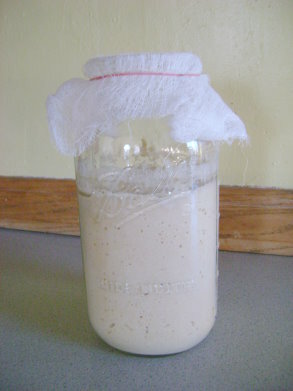 You have probably not noticed anything exciting happening to your sourdough starter yet. Still looks and smells like flour and water. Oh, but just wait! 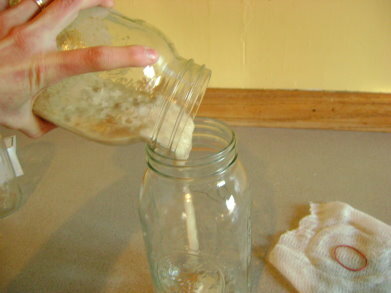 For tomorrow you’ll need a clean jar or glass bowl, 1 cup whole wheat or rye flour and about a cup of cold water. 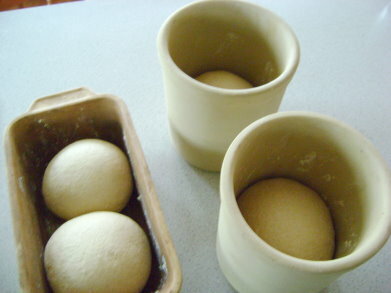 Sourdough bread is best baked in either glass or stone bread pans. Thought I should tell you that today so that if possible you can round up glass or stone pans for baking your sourdough bread. Some of you have expressed concern over having large enough jars for this process. If you can’t find half gallon jars (Try Ace Hardware if you have one close by. I ordered mine from Azure Standard. )…just use large glass bowls. That will work fine for this seven day process. Then…after you make your first batch of sourdough bread, the rest of your starter will fit just fine in a quart sized jar. Thanks for joining me making sourdough! !